I recently shared some updated thoughts on the prospects for a Greater Depression with readers of our International Speculator newsletter. Given the increasing levels of volatility sweeping global markets, I decided to give those thoughts a broader airing, below, if for no other reason than to help those of you in a position to rig for stormy weather get a sense of the gathering storm. Hopefully, I'll be wrong about what's coming. But the way I see it, being aware and prepared follows the same basic logic as personal gun ownership: better to have one and not need it, than to need one and not have it. You get the idea. It's been said that if you spend 15 minutes a year thinking about the economy, you're wasting 13 minutes. That's generally true. But as an amateur historian, I can't help myself. And I'm forced to believe that this is a time when the subject is worth some real thought. My view is that the longest, and certainly most important, trend in history is the ascent of man. I have little doubt that it will not only continue but accelerate. But that doesn't mean there won't be nasty setbacks along the way. As I have said before, possibly the best definition of a depression is a period when most people's standard of living drops significantly. You can also define it as a period when distortions in the economy and misallocations of capital are liquidated. The distortions are almost always the result of government intervention in the economy, through things like taxes, regulation and currency inflation. Those are the factors that caused the unpleasantness that began in 1929. Since the government is exponentially more powerful and invasive today than it was in either the 1920s or the 1970s, I expect the consequences will be much worse this time around. Things could have come unglued, and almost did, back in the 1970s. I don't see how we'll dodge the bullet this time. Although that's not really a good analogy, in that, for reasons we don't have time to explore in depth, a depression is probably inevitable this time. The only serious question in my mind is whether it will be essentially deflationary in nature, as it was the case in the U.S. in the 1930s, or inflationary like in Germany in the 1920s. My guess is the latter because the government is so much more powerful today. Or it could actually be both at once, in different sectors of the economy. Inflation could drive interest rates to 20%. This would collapse the bond and real estate markets, wiping out trillions of dollars of purchasing power - which is deflationary. Meanwhile, that same inflation doubles the cost of food and fuel. In other words, the opposite of what we've mostly had for the last generation, when we had "good" inflation in stocks, bonds and property, but stable or dropping prices in "cost of living" items. This time the pattern could reverse, which would be a nightmare for most people. And as people become more focused on speculation in a generally futile attempt to stay ahead of financial chaos, they inevitably divert effort from economic production. Which will decrease the general standard of living even more. The situation isn't made easier by the possibility that we're facing Peak Oil - the start of a secular decline in world oil production. Or the fact that Americans, both individually and collectively, are deeply in debt and living on the kindness of strangers. The problem with debt is that it artificially increases our standard of living. But when we pay it off, especially with interest, it reduces our standard of living in a very real way. Wrap this economic environment around the so-called War on Terror, which is rapidly morphing into the War on Islam, which could easily turn into World War III, and you're looking at the perfect storm. The odds of a major conflagration are very high, and it's not being adequately discounted. If Bush starts a war against Iran, or if another incident like that of 9/11 occurs, or even if the trend of the last five years accelerates, the U.S. is going to be locked down like one of its numerous new federal penitentiaries. And that will be accompanied, and compounded, by mass hysteria among Boobus americanus. At that point, your investment portfolio will be among your lesser concerns. People forget that, in every country and time, there's a standard distribution of sociopaths and misdirected losers. In normal times, they seem like normal people. But when the time is right, they show their colors, and they love to get jobs with the government, where they can lord it over their betters. Is the Greater Depression really inevitable? How bad will it be? Is there another side to the argument? Can it be avoided? I suppose it's not absolutely inevitable. Perhaps friendly aliens will land on the roof of the White House and present the government with a magic technology that can undo all the damage it's done. But we live in a world of cause and effect where actions have consequences. That being the case, I expect truly serious financial and economic trouble. And the government will make it vastly worse by trying to "do something" instead of recognizing itself as the cause and backing off. I don't see any way out. How bad will it be? In historical terms, the last depression was relatively short and mild. The longest depression on record was the Dark Ages. Residents of the old USSR and Mao's China suffered through a depression that lasted decades. I'm not predicting it will be that bad, if only because the U.S. has basically much sounder traditions and institutions and vastly more accumulated capital. But it's hard to overestimate how serious this could be. I sometimes joke that it will likely be worse than even I think it will be. Getting back to whether it's truly inevitable, it's a question of degree. The recession of the late 1970s and early 1980s involved a terrible stock market, 15% inflation with interest rates to match, 10% unemployment and a near war with the USSR. But the country not only hung together, it went on to a tremendous rebound. My guess is, however, that the last 20 years of good times will later be viewed as an economic Indian Summer before a harsh winter. The good news, of course, is that no matter what the economic conditions, technology - which is the mainspring of human progress - will keep advancing. And many individuals will continue innovating, saving and improving conditions for themselves and their associates. Also, it's entirely possible to go through even the worst of times and not get hurt. Indeed to profit from them. If the price of a house you want now but can't afford falls 75% (as outrageous as that may sound at the moment) while your own investments in the high-quality gold stocks we follow in our International Speculator quadruple, you're much better off. That house now really only costs you one-sixteenth of what it did before. Of course it's a problem for the guy who has to sell his house but I always prefer to look at the bright side of the equation. There's time now to structure your affairs so that you're on the right side of the trade. What indicators should we watch for that might tell us it's about to get ugly? Well, one obvious indicator is how the price of gold is running. Gold is the only financial asset left in the world that's either safe or cheap. It's also under owned and largely unrecognized, which is why the smart money has been moving into it. Then there's the CPI itself - although I don't think it's very accurate, in that all the adjustments, exclusions, weightings and what-nots the government has insinuated into it over the years makes the CPI as much of a floating abstraction as the dollar itself. It's funny how the government plays with figures for fear of hurting confidence. They believe the economy rests mainly on confidence, which, ironically, in today's world, is true. Unfortunately, confidence can blow away like a pile of feathers in a windstorm - and we have a class-5 hurricane coming. If the economy were sound and people for some reason lost confidence, the currency and the banks would be unhurt, and the next day things would go back to normal. But that's not the world we live in. So, higher CPI numbers are another thing that could destroy confidence and supercharge the gold price. They're coming. Higher interest rates, which we're already seeing, will inevitably burst the real estate bubble, which is floating on a sea of mostly adjustable-rate debt, a lot of it interest-only or even with negative amortization. Higher rates will also crush bonds and probably stocks. And they'll devastate the economy since everybody is deeply in debt. However, I feel the Fed will keep short-term rates - which are really the only ones they control - as low as possible for as long as possible. For one thing, they don't want a recession, which this time could snowball into the Greater Depression. For another, my guess is that they want to gradually depreciate the dollar against other currencies, in part to decrease the chronic, massive trade deficit. And because increasing the number of dollars makes people think they're richer than they really are, it can stimulate some additional spending but these days that spending is mostly done on credit, so it is only illusionary. The biggest single problem, however, is that there are trillions of U.S. dollars outside of the U.S. Unlike Americans, foreigners have no reason to hold them. And at some point very soon, perhaps when the Fed finally hits the wall on its ability to raise rates, these overseas dollars are going to start flooding back home, while the products and titles to real wealth flow out of America. Therefore, when the trade deficit starts turning around - which most people will think is a good thing - that will be the real tip-off the game is over. Trillions coming back to the U.S. will skyrocket long-term interest rates and inflation. The dollar will go into freefall. But although I think these are the things to watch, to my way of thinking it makes no sense to wait until the stampede starts to try to get out the door. If you haven't done so already, take advantage of the current correction in gold to begin repositioning your portfolio for what's next. 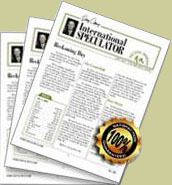 For information on the International Speculator, click here. DOUG CASEY is the author of Crisis Investing which was #1 on the New York Times Best-Seller list for 26 weeks. He is also editor and publisher of the International Speculator, one of the nation's most established and highly respected publications on gold, silver and other natural resource investments.